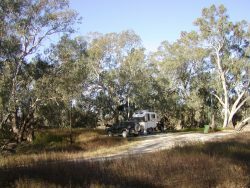 For the next two nights, we are staying on a 200,000 acre sheep station (with a recent additional purchase of land), 132kms out of Bourke, on the Darling River. 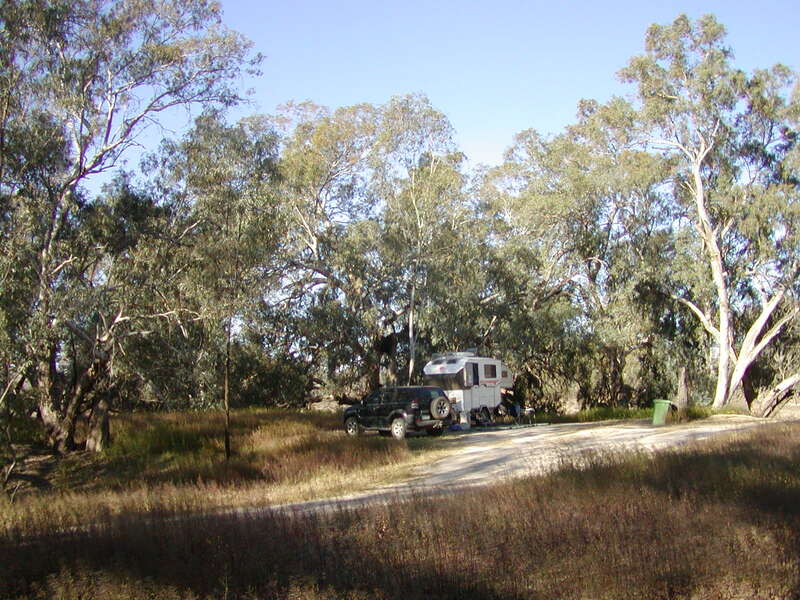 Our campsite is on the river bank, but we can’t see the trickle of the Darling, unless we stand on the edge of at least a 30 metre high bank. We were greeted by a large flock of red-tailed cockatoos and some beautiful parrots (yet to find out what they are). The owners, Gary & Liz Murray, are fifth generation “Murrays”. The first generation settled here in 1860. Initially, Trilby was part of Dunlop Station, which was the first station to introduce mechanical shearing and despite a shearer’s strike and protest, ended up shearing 276,300 sheep in 1894, 235,000 in 1895, and from 1900-1910 there was never more than 100,000 shorn, because of drought (90,000 died in 1896). In the early 1950s, Dunlop was divided 5 different ways – all to the Murray children, except one – a woman, who was married! Today, on Trilby, they only manage to run 6,000 sheep, all hand fed at the moment! Gary has to regularly check the entire property, making sure all troughs have water, which takes 11 hours by vehicle, but if he flies (they have two planes and a helicopter! ), it’s only one and a half hours. There is a schoolhouse on the property, which their ten year old son attends with his governess, using School of the Air, now with satellite coverage, meaning Wil can see his teacher. On arrival we were loaned two bound books, one with a complete history of their family, the property, lifestyle etc. and the other contained mud maps of trips over their property. In the afternoon of Day one we did Mud Map 1, taking us to the Old Dunlop Farm, where the remains of their first steam engine (which was used to drive a thrashing machine or chaff cutter), and many demolished buildings – deliberately dismantled so the material could be used to build the shearer’s shed, garage and old shearer’s huts at Trilby. Very cold this morning (10 degrees), so Russ lit a fire and we had jaffles. 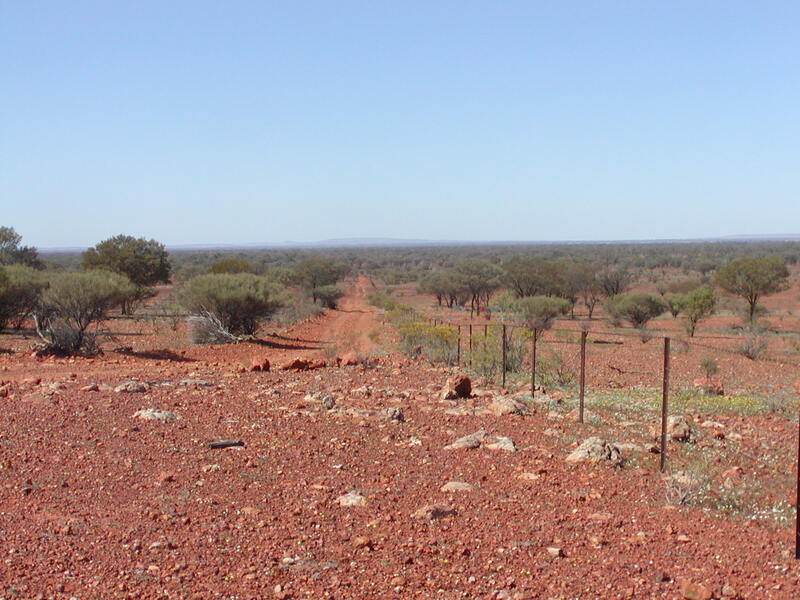 (We are noticing the differences in temperature as we are heading south – from high thirties in Far North Queensland, to thirty in Windorah and Quilpie, to high twenties in Bourke and, after the sun gets over the trees, low twenties here!). A nice warm shower as well, made lunch to take with us and set off on Mud Map 2, a much longer drive. 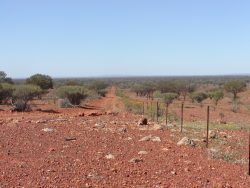 Just over 50kms in all, on 4WD tracks (mainly for clearance), we saw strong, steel holding yards, different fencing requirements – lighter fencing for the ewes, stronger for the rams (which only have six weeks with the ewes, the rest of the time they try to get out to be with them! They also housed goats, which needed stronger and higher fencing still, but were worth rounding up, because of the export market, where they were trucked to the abattoir, blessed, slaughtered and then exported overseas to mainly SE Asia. Goat is the most universally eaten meat. Over the trip we were informed about the useful plants for cattle and sheep, the weeds and shrubs that only goats will eat, all the tanks, bores, dams and were given an extremely good insight into the hard work that farmers have to do, all done in such barren conditions. We came across the old homestead, New Chum House, abandoned in 1965, with everything left “as was”, in case someone needed to shelter from flood, or whatever. We saw the remains of two cars, once belonging to two fencers, who lived in an old bus, another relic. 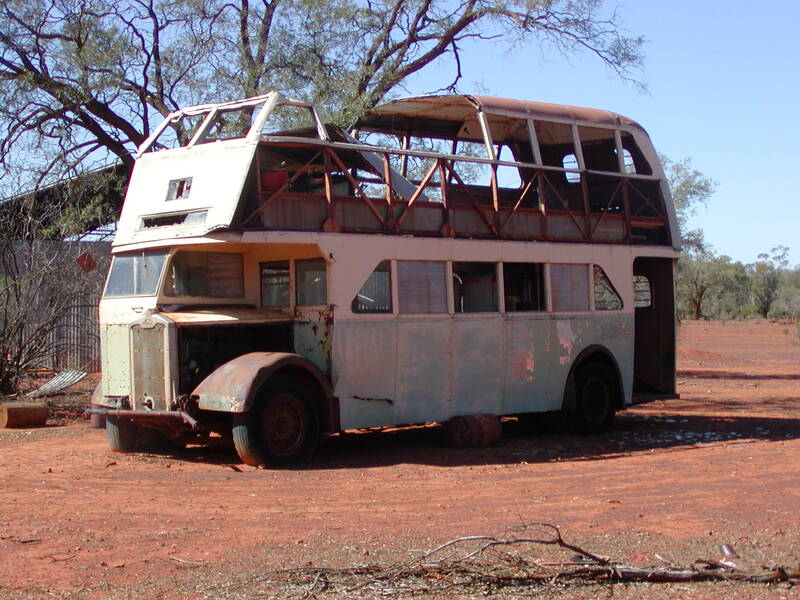 The roof of the bus is wiped off, as the story goes, because “they loved a drink or two and didn’t judge the bridge”. As we have passed through these properties from the north, we have often asked “why” and “how” they live where they do and now we know the hard slog people have out here. If it’s not a flood, then its years of drought. Speaking to Liz, who’s been here for more than 26 years, she absolutely loves her life and the property, despite being hemmed in for 3 months due to flood.